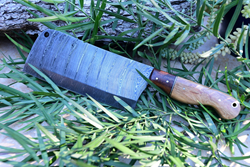 DKC Knives is thrilled to release its newest series to their handcrafted line of Damascus Steel Knives. The "YAKIMA SERIES" is a line of custom handmade knives that have an array of designs from hunting to chef style designs. I loved the knife so much I have ordered 5 altogether for different members of my family. DKC Knives, known for their beautiful handcrafted Damascus steel knives, has just released it's newest series to their custom made line. The"YAKIMA SERIES”, is line of custom handmade knives that have an array of designs from hunting to chef style designs. This series of knives are made for everyone, with over 8 different tailored designs. The “YAKIMA SERIES” features a 4 different styles of chef knives, 3 styles of hunting knives, and razor blade style. One review from an Etsy customer raved, "DKC has excelled this time. It's a perfect knife: a good weight and size and fits perfect in your pocket. Some knives are too heavy and bulky, but this is spot on. I loved the knife so much I have ordered 5 altogether for different members of my family." Each knife from the "YAKIMA SERIES" knife is equipped with a leather seethe and sharpening stone. DKC Knives is proud to announce the new "YAKIMA SERIES" is one of the best selling lines for DKC for its unique wood grain finish.